The takeover of Merrill Lynch by Charlotte-based Bank of America represents another step in the emergence of a true full-tilt competitor to New York as a financial capital. Already dominant in commercial banking, the acquisition places the North Carolina metropolis into the first ranks of cities in wealth management. Today, Charlotte is a stepchild no longer. Taking advantage of a traditional Southern sense of being under-estimated, the leadership in this region of some 1.5 million has worked to become not only a bigger place but an important one. Like Houston, Charlotte represents a classic opportunity city, a place built by newcomers used to not getting too much respect. While other New York rivals like Chicago and San Francisco could seem cosmopolitan enough to be real contenders, Charlotte has emerged very much out of nowhere, in a charge led by people who, at least before the last decade or so, seemed like nobodies. Charlotte’s ascendancy has not been brought about by a well-developed hierarchy but by entrepreneurs like Bank of America’s Hugh McColl, many of whom came from smaller southern cities to Charlotte in the 1960s and 1970s. In the ensuing decades, through mergers and regional expansion, Charlotte has vaulted past not only its southern rivals but traditional banking power centers like Chicago, Pittsburgh and San Francisco. Although Charlotte had been home to banks for generations, two men dominated the city’s ascendancy, McColl and Wachovia’s Ed Crutchfield. Taking advantage of North Carolina’s liberal banking laws, these two dynamic leaders spent much of the 1980s and 1990s gobbling up other region’s banks, including the 1998 takeover of San Francisco’s greatest financial institution, the Bank of America. In the process, Charlotte basically wiped out most of its major competitors, and now has more than three times the assets of the remaining San Francisco banks. Today only New York stands ahead of Charlotte --- and as the Merrill takeover suggests, what’s left of its humbled financial sector now sits in the crosshairs. Like other opportunity cities, Charlotte has the lure of greater affordability to lure younger talent to their city. The top flight multi-millionaire players may stay in New York and Greenwich for decades to come, but Harris and others believe more and more of the financial industry will continue to migrate to their city. Although banks are important, they are not the only major players. Equally important, Charlotte has become home to other big Fortune 500 employers such as Nucor Steel, Duke Power and Lowe’s. Unlike New York, San Francisco and Chicago, which are all rapidly losing their good blue-collar jobs, Charlotte continues to develop its industrial and warehousing sectors. Over the last 15 years, for example, the Charlotte area has added jobs at a 2.57 percent rate, compared to under one percent for New York, Los Angeles, San Francisco and Chicago. Reasonable housing costs and a diversified employment base, notes Harris, allows Charlotte to compete broadly not only at the top levels of management, but across the board far more than a more expensive metropolitan region. “It’s hard to be a mass employer in San Francisco,” he notes. Yet, despite the relative advantage of affordability, the financial industry will likely determine the city’s future. Much as Houston has used its port and the energy industry to move from an opportunity to a nascent world city, Charlotte’s business leaders feel that the clustering of financial and high-end business service firms in the area will take them to the next level. The appeal of the area can be seen in the migration numbers. Latino immigrants, for example, feature prominently in both lower-end service, construction as well as skilled trade. The region had among the fastest growth rate in immigration of any major U.S. region over the past decade. Equally important, the city, like much of the Carolinas, has emerged in the last decade as a primary draw for people fleeing the high costs and slow job growth of the Northeast. Prominent among these newcomers are a strong wave of educated migrants --- since the mid-1990s it has ranked among the top two or three destinations per capita for those with college degrees. 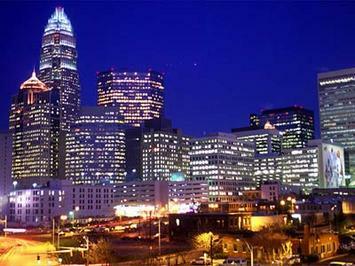 The popularity of Charlotte among younger educated workers has allowed large companies to find adequate trained staff. Perhaps more importantly --- note this New York! --- the town has been developing more sophisticated financial firms, including boutique capital market companies, even before the Merrill acquisition. Although both Bank of America and Wachovia have been hit by the problems afflicting investment banks everywhere, it would be not be surprising that in the next expansion, more of the action may shift from New York and San Francisco to Charlotte, largely due to its greater affordability. Like Houston after the 1980s energy bust, Charlotte may be well positioned to pick up the pieces even as the finance industry hits the skids. For all the big city talk among its elites, many Charlotteans understand that their city’s key competitive edge lies not in becoming not too much like New York. Of course, both natives and newcomers alike appreciate the city’s evolving cultural scene, its improving restaurants as well as some very charming, well-maintained urban districts within walking distance of the burgeoning downtown office district. But at the end of the day, Charlotte is not New York, and likely will never be. In this sense, history does not repeat itself. What it offers instead is the prospect of a quality of life --- a nice house in a good neighborhood, decent schools, particularly in the affordable nearby suburbs, access to the countryside --- that has become prohibitive for most in entrenched urban centers. Joel Kotkin is the Executive Editor of Newgeography.com. Submitted by tofifi08 on Wed, 05/13/2015 - 03:48. I am very much impressed from your post.It has amazing information.I learned a lot of new things which explores my knowledge in developments. Submitted by edwardmuphy on Fri, 04/17/2015 - 04:46. Submitted by oralgreen on Sun, 05/10/2009 - 10:16. Charlotte may be the the home of one of the United States largest banks, but anyone who believes Charlotte is a cosmopolitan city is delusional. I suggest the delusion can be cured by a visit to one of the United States' truly cosmopolitan cities...New York City, Chicago or Los Angeles. I have visit all four cities and have first hand knowledge about these cities. Sorry Charlotte! Submitted by jamrao on Wed, 06/19/2013 - 00:32. An excellent blog site constantly comes-up along with brand new and enjoyable data and while reading through We've think this web site is actually have the many excellent which qualify a blog site to become just one. We've exhibit many of the articles or blog posts on the web page now, and I like your style connected with writing a blog. Submitted by Auto on Tue, 09/16/2008 - 09:46. The piece reads like something coming from the Charlotte chamber of commerce. I remember reading something similar about 10 years ago arguing that North Carolina was poised to be another Silicon Valley because so many tech-savvy employees were drawn to the state. Turns out that they had the entrepreneurial spirit of postal workers. Too many, it seems, had been trained in the military. So they were highly sought after by telecoms and insurance companies and other firms whose businesses/industry were regulated. They were not the sort to start new firms themselves. As far as Charlotte becoming a financial powerhouse, it will always lag New York and Chicago because it lacks exchanges. I think the better comparison is Charlotte as another Boston or San Fran -- important without being central. Each city has VC and money managers and does lots of custody/consulting work for Wall Street. Which is to say, Boston and San Fran live off and depend on NYC/Chi exchanges. Charlotte-based banking is likewise dependent on NYC/Chi. Submitted by Joel Kotkin on Tue, 09/16/2008 - 09:59.
i appreciate the response. but actually raleigh-durham is doing extraordinarily well from all the reports and statistics i have seen. the rise of places that we both might find somewhat less than exciting should not be hard to understand. it's about costs, affordable quality of life, particularly for families. i always tell my students to be careful not to confuse their own personal preferences with what other people might want. and as to your point about exchanges, it makes my suggestion even stronger. Submitted by JackofAllPros on Thu, 05/28/2009 - 21:27. Good Points, but you have to admit, "The takeover of Merrill Lynch by Charlotte-based Bank of America represents another step in the emergence of a true full-tilt competitor to New York as a financial capital" kind of turned out just the opposite.